Bapu’s favourite fabric is out to give denim a run for its money as the all-American brand Levi’s launches a collection of khadi apparel. This party’s over,” Samuel Jackson’s character Mace Windu tells Palpatine in Star Wars Episode I: The Phantom Menace, wearing a grim look and a khadi robe. Yes, you heard that right. Jackson’s beige and brown robe in the movie was made of khadi. It’s been fifteen years since Jackson donned that robe but the party is far from over for India’s national cloth. Besides holding the country’s political class completely in its clutches, the fabric is also used extensively by heritage-conscious designers like Ritu Kumar, Neeru Kumar and Madhu Jain. Mumbai’s Gaurang Shah—who has worked with the fabric for over 10 years—presented a khadi-centric collection at Berlin Fashion Week this July. Models sashayed down the ramp wearing off-shoulder flowy dresses, layered tunics and jumpsuits made of khadi and left the audience applauding the fabric’s versatility. Shah isn’t the only one to have pulled khadi out of its comfort zone. Sabyasachi used the textile to give his bridal lehengas a twist at Delhi Couture Week while Gaurav Jai Gupta of Akaaro spun new style stories out of it at the Wills Lifestyle India Fashion Week 2013. Khadi’s high-style makeover began in 2001 when Vasundhara Raje, then minister for small scale industries, invited designers Rohit Bal and Malini Ramani to create clothes for the government-run Khadi stores. The two sent out a series of kurta, jackets, dhotis, bundis and saris. The garments were very well received and practically flew off the shelves but were not replaced. But now, the fabric gets a global twist. The all-American brand Levi’s has decided to mark our Independence day by making jeans out of khadi. The company has created the famous five-pocket jeans, a trucker jacket and Barstow western shirts in khadi. Because the fabric is being woven on hand looms, no two pieces will look the same. 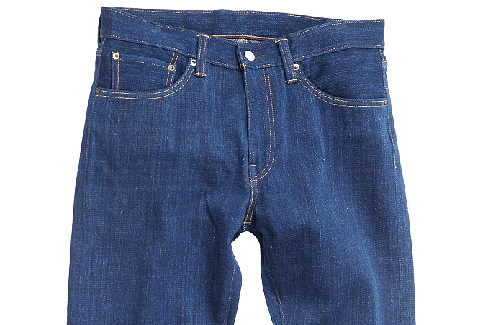 What’s most charming is that each pair of jeans will carry the name of the weaver and the place where it was created. Available only at select standalone stores in metros, the charm comes at a price: jeans for `10,000 and jackets for `15,000. Good things no cheap, cheap things no good. Levi’s would agree.